Hello, friends! A lot of stitching behind the scenes here, although no blog posts (shame on me 🙂 ). 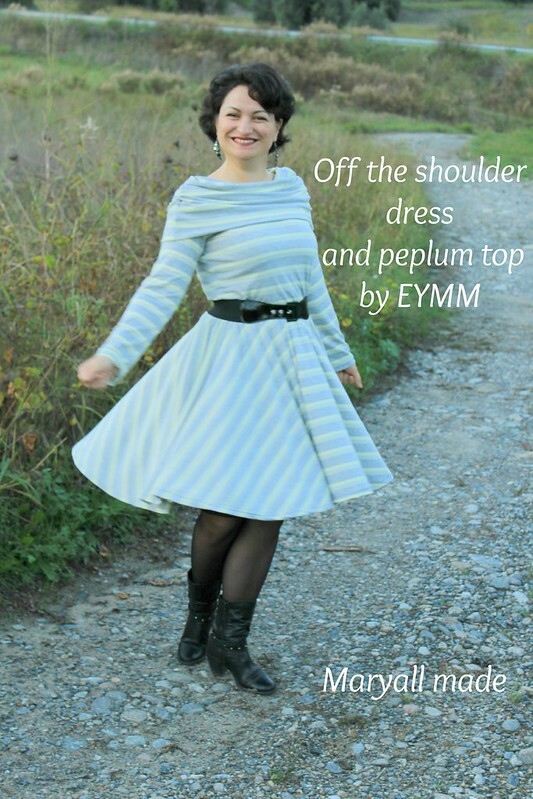 Here’s my latest project: the EYMM Off the shoulder dress and peplum top. The pattern is rated as suitable for an “Advanced beginner” and I totally agree. There aren’t difficult areas, except maybe for the cowl, but the instructions and the photos are detailed and the entire sewing process is pretty smooth. If you can sew a straight line, and follow written instructions, you can sew this! I made a size L. Long sleeve, circle skirt, above the knee length option. I used a jersey I ordered online – I had bought 3 m of it, and only have some small pieces left. I don’t remember the content, probably polyester and 5 or 6% spandex. 1. 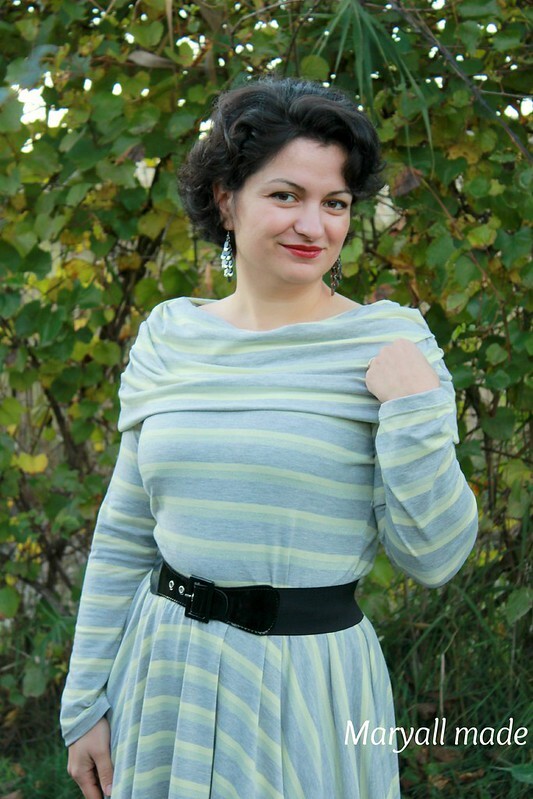 This dress was made with zero – 0 – none alterations of the testers’ pdf version! Of course I’m happy! This means not much work to do for me as a tester, and as a sewist, well, I’m happy to find out that Kymy, the designer behind EYMM, really drafts for us curvy gals! This was my first EYMM pattern, but it definitely won’t be my last! In the final pdf pattern version, the sleeve was taken in a bit and shortened, too, and there are now two cutting lines: one for the peplum top and one for the dress bodice. 2. On my next onlie order for fabric I need to include some other jerseys and novelty knits. I can see more dresses and peplum tops in my life now! This is a “dressed down” version, but can you imagine making the top in one single colour, and the skirt in a print? The skirt can be also made of woven! And I can’t tell you how many compliments I had on the dress and on how well it suits me! And the interesting cowl! For me, this is a winner!